Worldwide, commercial electric utility power is generated and distributed in “three-phase” (3-Φ) form. To derive the “single-phase” residential, light commercial and small office power typically used throughout North America, a utility transformer at the street connects to one of the three energized “hot” legs of the utility’s 3-Φ distribution system. The transformer’s winding ratio is designed to adapt the utility’s distribution voltage, as its input, to the desired single phase, 120V/240V output that end-users require. There is, however, a second way to derive a power source that looks and acts very much like that derived from a street transformer. Terminology is our enemy here. This second method is sometimes called a “split phase” source and sometimes called a “network connected” source. And unfortunately, the term “split phase” also has other meanings. I will use the term “split phase” to refer to a method of powering residential and light commercial customers via a direct attachment to a true 3-Φ, wye-connected distribution circuit. That is, to describe an alternative means of powering loads (homes, offices, stores) that would otherwise need to be powered by a true single phase 120V/240V circuit. In large facilities, it is less expensive in capital costs, and takes up less floor space, to install and maintain split phase systems than single phase systems. Particularly in facilities that also require true three-phase power (large pumps, large blowers, large air conditioning compressors, escalators, elevators, commercial kitchens), split phase systems are very cost effective for delivering very large numbers of the ubiquitous 120V lighting and utility circuits. Examples include malls, apartments, condos, hotels, high-rise and commercial buildings, airport buildings, manufacturing facilities and many other public and private facilities. And that would also include marinas. Of course, in malls, hotels, high rises and airports in North America, the vast majority of transient visitors never have need for access to 240V power, so they don’t know or care that it’s really not available and really not 240V. In the case of marinas, however, transient boats with 50A shore power fittings often have on-board appliances rated for use with 240V power. In that case, it may matter if the shore power provides only 208V. An AC voltage of 208V is a brownout level for 240V equipment. Generally, no lasting damage occurs at 208V, but in the event of a true brownout throughout an entire utility distribution system, “street voltage” can fall as low as 192V or less, and that can cause motors to overheat, trip out on thermal safety, and be unavailable for their intended use. Nevertheless, the fact is, marina operators can dramatically reduce electric infrastructure capital costs using the split phase approach, so it is likely that all boaters, all across North America, will occasionally encounter split phase 120V/208V power at dockside pedestals. 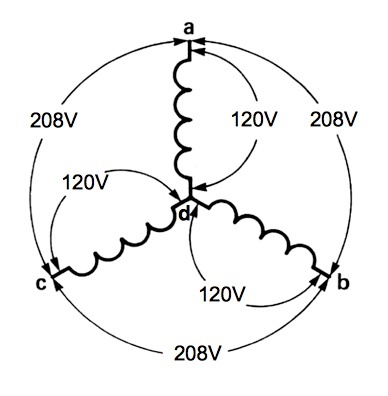 The two energized “hot” wires (red, black) could be connected, for example, at points “c” and “b.” The neutral (white) would be connected at the star-point, “d.” In this three-phase source, the voltage measurement between point “c” and the star common-point, “d,” would be 120V. Likewise, the voltage measurement between “d” and “b” would be 120V. This design supports the vast majority of end-user AC electrical attachments found across North America. But, the phase-to-phase voltage measurement between points “b” and “c” would, in fact, be only 208V. Leaving out the math, this is because the voltage waveforms at “b” and “c” are 120° out-of-phase with each other. The phase-to-phase voltage is √3 times the phase-to-neutral voltage, so V=120*1.73=207.6V. Boats with 2, 120V, 30A shore power cords that encounter this situation will never know it. Likewise, boats with 50A, 240V shore power cords but without 240V appliances or motors will never know it. But aboard boats with 50A, 240V shore power circuits and 240V appliances and motors, poor appliance efficiency and motor overheating may occur. This can particularly affect motors that drive water pumps and heat pump compressors. Two-hundred-forty volt cook tops, ovens, water heaters and clothes dryers will all operate at lessened efficiency, but are not otherwise affected. They just take a little longer to do their work. Assume that identical AC loads are drawn by the same boat in two different marinas. One of the two marinas has conventional 120V/240V single phase power, and the other marina has 120V/208V split-phase power. Even though the electrical loads drawn by the boat are identical in both cases, there will be a very significant difference in the numerical size of the current measured in the boat’s shore power neutral conductor. In split phase systems, because the two line-to-neutral voltages are 120° out-of-phase, neutral currents behave very differently. In a split-phase system with balanced loads on both legs, the neutral current will actually approach the magnitude of the currents flowing in the hot legs. Examples may help. Consider a boat wired for a single phase 120V/240V source or power. When on shore power, on a cool September evening, assume that the boat draws 15A on one of its 120V legs and 17A on the other 120V leg. In this example, assume for simplicity that there are no 240V loads. When attached to a true single phase, center-tap neutral source, the neutral current in this case would be 17A-15A=2A. However, served by a split phase source, the neutral current would be approximately 16A, and perhaps slightly higher depending on which leg the loads are on. The maximum case with a 50A shore power source is 50A loads on both legs simultaneously, with no 240V/208V loads. Because of the 120° phase-to-phase voltage difference, split phase system will experience 50A flowing in the neutral. Detail on this for those interested is shown below in the footnotes.2 This amount of current is within the ampacity ratings of UL-Marine rated shore power cordset conductor and insulation ratings, and is not a cause for concern. Home-made cordsets, on the other hand, may present risks if they do not meet UL-Marine standards. Boaters requiring 240V for on-board appliances can compensate for the issues created by split phase 208V shore power systems by fitting their boat with an isolation transformer. Depending on features, some isolation transformers can accept single phase and split phase inputs of various voltages, and produce true single phase, 120V/240V outputs for use by all installed AC boat equipment. Some isolation transformers are designed for manual operation, and some are fully automatic. All are heavy, bulky and expensive, so they are not “ordinary OEM equipment” aboard most cruising boats. They are more typically found on the more high end and bigger boats. Isolation transformers are different from conventional AC shore power, and there are specific ABYC E-11 electrical installation requirements for properly installing them. So, in summary, with 208V split phase circuits, the boat is getting what looks and acts like a single phase, center tapped shore power circuit. 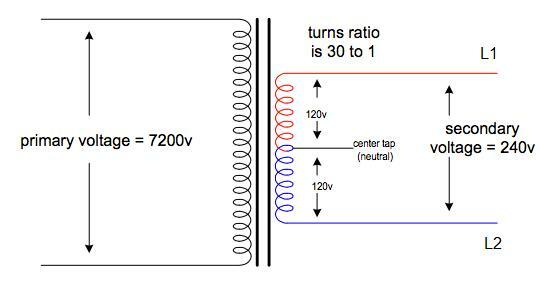 Transformer ratios designed to provide 120V leg-to-neutral voltages. Because of the phase angle difference between the phases, only 208V appears from hot leg-to-hot leg. Ia = 0A, Ib = 50A, Ic = 50A. Following is a more general case of this calculation that accommodates inductive and capacitive power factors that might be found on boats with raw water circulator pumps and heat pump compressor motors. In this formula, one can adjust the nominal 120° phase angle difference to reflect the phase angle difference caused by power factors. In this formula, the left hand factor combines the horizontal (real) current components of the respective phases and the right hand side combines the vertical (imaginary) current components. This entry was posted in 208VAC Electrical Systems at Marinas on 2014/08/30 by gilwellbear.